I’ve found my solution to turkey burgers! GUACAMOLE. 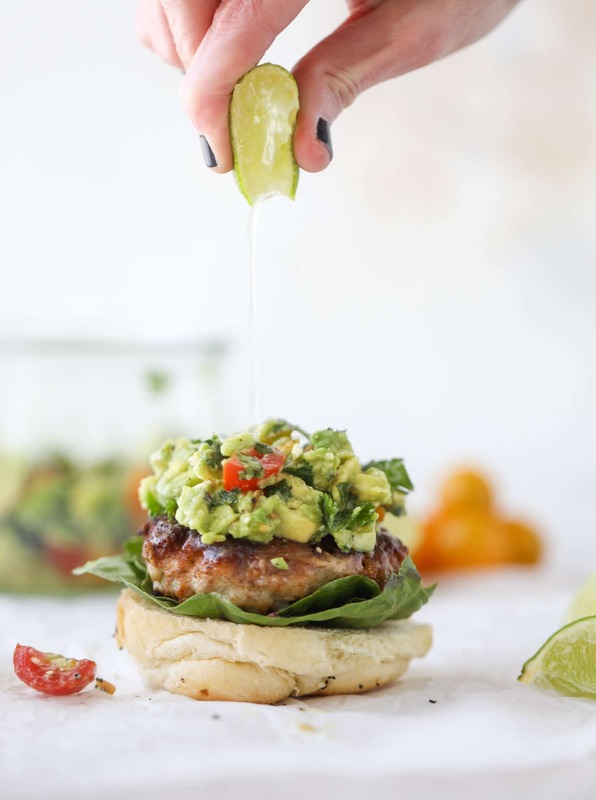 Guacamole turkey burgers, to be exact. I have guacamole on my burgers. Heck, I’ll even put guacamole IN my burgers! I know I know. I share a turkey burger every now and then, but the whole thing is really funny because it’s the dish that I always say Eddie ruined me on. Remember when we met and he ONLY ate plain (very plain) turkey burgers and plain whole wheat pasta with plain eggs? No seasonings, no sauces, none of that! I’m still a little scarred when it comes to turkey burgers. For instance, they have to be delicious and covered with all sorts of things (like these mediterranean ones! With creamy feta!) that make me forget that I’m eating a, well.. turkey burger. My biggest takeaway from eleven years of turkey burgers? I’ve stopped using ground turkey breast. It’s just way way way too dry to be palatable for us. However, my grocery store has a 94% lean version and we love that. In fact, I’d rather take the fat in the burger and skip the cheese. You know I mean business when I say I’d rather SKIP THE CHEESE. It’s bad. I’m not myself. These burgers are loaded with seasonings and flavor. I took my regular old turkey burger recipe from ten years ago (it’s on here, it’s horrifying!) and readjusted some of the flavors and ingredients. I also use a thermometer now so I don’t overcook them (dry turkey burgers are the worst, who’s with me?) and then find something delicious to add on top! Obviously I went with guacamole here. I added a few tomatoes to this guac too for a little extra punch and a squeeze of lime juice turns these into perfection. Quick pickled onions (which I try to keep in the fridge every week) add extra briney flavor too. Because of that, when the burgers are chopped up on a salad or thrown in a wrap, they taste incredible. Like, really good! 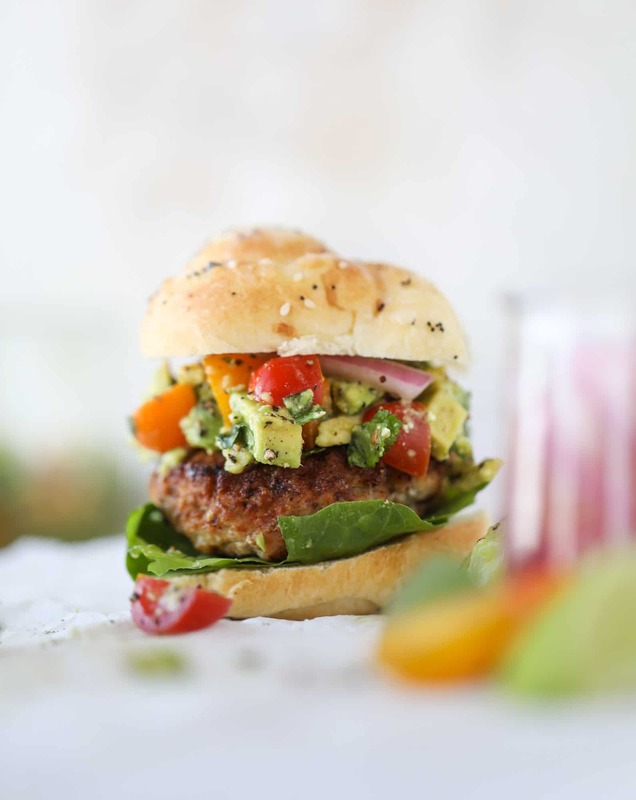 These turkey burgers are full of flavor and topped with a delicious chunky guacamole to take the flavor over the top. The perfect easy dinner! Place the ground turkey in a bowl. Grate in the shallot and the garlic. Add in the bread crumbs, paprika, cumin, salt and pepper. Splash in a drop or so of Worcestershire sauce. Add the beaten egg white and mix everything together (it works best if you use clean hands!) until combined, but don’t over mix. Form the mixture into 4 or 6 patties (or however many you’d like!). Heat a skillet over medium heat and add a drop of olive oil. Add the burgers and cook until they are brown on the outsides, about 5 minutes per side. To make sure the burgers don’t dry out, you can check the internal temperature – you want it to be about 175 to 180. I let the burgers rest for 10 minutes before eating. To make the quick guac, chopped the avocado into chunks. I like to take half of this and smash it with a fork, and keep the rest cubed for a chunky guac. Do it however you love! Mix in the tomatoes, cilantro, lime and salt. Place your lettuce on the bun and add the burger on top. Top with a few scoops of the guacamole. You can also top with some pickled onions if you’d like! Serve immediately. Just going to guac my entire life, brb. OMG! We’re obsessed with the Mediterranean ones, but we may have to switch up and try these! so glad you love those ones!! 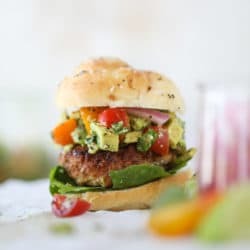 i love turkey burger superb recipe looks and sounds delicious! hi! 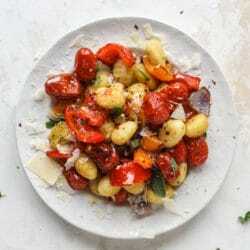 yes, if you run your mouse over the photo, you can pin the recipe! :) thank you! Thanks a lot for sharing this creative recipes. i enjoyed it very much while reading whole blog and the taste of ground turkey is marvellous after marinating it with some salty and spicy ingredients.